The winners were spread across 43 categories, including healthcare, hospitality, engineering systems, pharma, and bio. 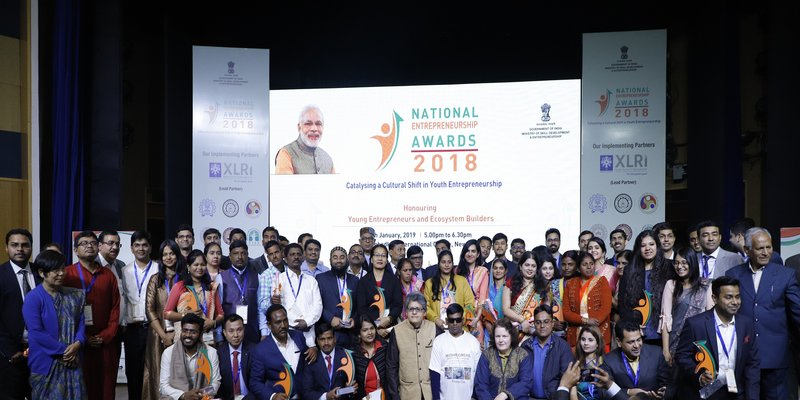 The Ministry of Skill Development and Entrepreneurship (MSDE) has awarded 30 outstanding young entrepreneurs and three entrepreneurship ecosystem builders at the end of its third edition of the National Entrepreneurship Awards (NEA). Each winner received a cash prize of Rs 5 lakh, while each ecosystem-enabler bagged a cash prize of Rs 10 lakh. The winners included 23-year old differently-abled Roshan Kahtoon, who has set up her own bangle manufacturing unit; 33-year old Shruthi Reddy Sethi, who offers end-to-end funeral management services; and 35-year old Tana Sumpaaged from Arunachal Pradesh, who is running piggery farms and fisheries, and also helping local people, women, housewives and unemployed youth with quality training and livelihood support. YourStory’s 2018 Tech 30 startup PregBuddy was also one of the 33 winners. Bengaluru-based PregBuddy provides a platform to the expectant mothers to get access to doctors, hospitals, and also for sharing experiences with other expectant mothers through vernacular support communities. The winners, who received awards from Suresh Prabhu, Minister of Commerce & Industry and Civil Aviation, were spread across 43 categories, including healthcare, hospitality, engineering systems, pharma, bio, among others. All the entrepreneurs are first-generation entrepreneurs and below the age of 40 years. While congratulating all the 33 winners, Suresh Prabhu said the definition of entrepreneurship is constantly evolving and with the change in fixed tenure jobs, the nature of working environment is changing – more people are creating their job space versus joining a certain industry. He further added that the change in the market environment is no more a challenge, but has become an opportunity for many. “The Government of India’s initiatives like Mudra Yojana, Start Up India, the GeM portal, etc. are giving the best and most conducive environment to our young entrepreneurs,” the minister said. The National Entrepreneurship Awards (NEA) were instituted by MSDE in 2016 to encourage a culture of entrepreneurship across the country.